Spinning on the turntable today in the ‘rock room’ is the flip side to the famed 1965 7’ Byrds' single ‘Turn, Turn, Turn’. Composed by Gene Clark, the cut, ‘She Don’t Care About Time’ is not only one of Clark’s finest compositions and best renowned songs; but also an influential and important part of the entire pop/rock mid-1960’s discography. 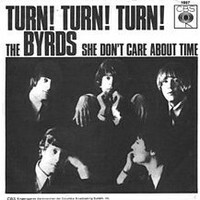 Released on October 29, 1965 the single ‘Turn, Turn, Turn’ b/w ‘She Don’t Care About Time followed the staggering success of the Byrds ‘folk-rock’ cover of ‘Mr. Tambourine Man’. 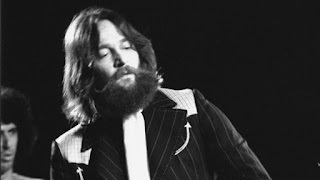 While in the groups early stages they concentrated mainly on Dylan covers and re-imagining’s of traditional folk numbers, Gene Clark, the band’s primary songwriter, focused on developing his own melodic and lyrical skills. Clark would leave behind the accessibility of other people’s songs and would dive headfirst into exploring his own emotions and dreams through melodic and metered poetry. In what would eventually become a bone of contention effecting the dynamics of the group, Clark’s songwriting skills offered him more money and greater attention than other principals in the band. In an ironic twist of fate Jim (Roger) McGuinn, David Crosby and Chris Hillman would later earn greater recognition for being members of the Byrds than Gene would being the principal songwriter in their formatve days. While Clark’s stint in the band would be brief he was the perpetuating force in the group during their most influential and popular era. 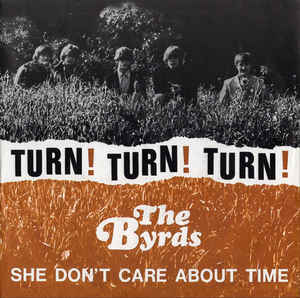 ‘She Don’t Care About Time’ would not appear on the LP Turn, Turn, Turn and would only be available on the ‘B’ side of the aforementioned ‘Turn, Turn, Turn’ single. Although later appearing on a number of greatest hits compilations; in what would seem to be typical of his musical career, one of Clark’s finest early moments of a composer would be nestled on the flip side of a Byrds' single. Instrumentally the song was influenced by the Beatles and after its release it in turn influenced the Beatles back. While both groups competed in the charts, as artists and musicians their influence was shared even across the expanse of the Atlantic. ‘She Don’t Care About Time’ begins with the recognizable and glistening ring of McGuinn’s Rickenbacker guitar. As Michael Clarke’s drums enter one is instantly reminded of the Beatles 1965 single ‘Ticket to Ride’. The sparkling picking and the start/stop tom-tom oriented drum groove definitely share a similar musical aesthetic to the Beatles track. The song would also in return later be cited by George Harrison as an impetus and influence for his own 1965 song, ‘If I Needed Someone’ which likewise contained soaring and seamless three part harmonies. The similarities between the two tracks end there though as Clark’s lyrics equal and in the ‘rock room’s modest opinion even surpasses the Byrds’ lyrical contemporaries of the time including the Beatles. Clark’s lyrics evoke a woman comprised of dreams and perfection. Figuratively, the woman does not need to heed time as she is timeless. As McGuinn’s aforementioned picked intro is dispersed with, Crosby cuts rhythm strokes across the lick. The drums then rumble in with the appearance of the stunning signature Byrd three part harmonies. The vocal melody is the dolloped on top of the sturdy pop backing comprised of Clarke’s uniquely tumbling drums and the muted pluck of Hillman’s bass. Crosby and McGuinn express themselves deeply through their respective riffs. The contrast lays in-between the central melody and band instrumentation, combining to express the deep originality of the cut. He track is a pop song with an ear worm melody balanced somewhere between the band’s folk beginnings, psychedelic zed minds and fertile musical beginnings. Clark’s poetic sensibilities are the star of the song. His deft portrail of complex emotions distills a deeper meaning from his lyrical construct. The subject of the song is spectral, the perfect partner, or woman, or in the ‘rock room’s’ opinion the mysterious muse. Clark knows that she or it waits without regret. Time means nothing for a mystery or for a love as deep as the ages. The simple depth of the lyrics and rich artfulness is second only to Dylan in this era. Mid song McGuinn takes a short quivering solo that quotes Bach while offering a mystical respite before heading back into the verse; as the song has no true chorus. 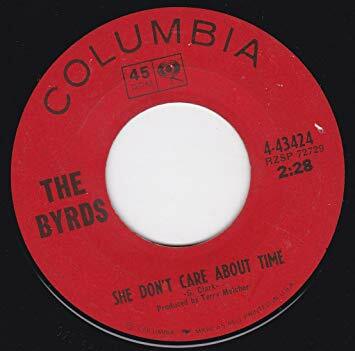 Packed into a two and a half minute flip side, ‘She Don’t Care About Time’ sums up the early Byrds and the mid-1960’s folk rock aesthetic, all the while expressing something fresh, yet staying perfectly within its own time. The song has aged well and is well regarded by the band with both Clark and Hillman recording 'cover' versions in both 1972 and 2017 respectively. Clark’s flight with the Byrds would be turbulent, but stunning in its ascent and brevity. Unfortunately success would shake the young band to its foundation and haunt Clark’s future days as an artist and musician. His songs when examined in hindsight are always ahead of the curve and foreshadowing the next move to come in whichever genre he saw fit to explore. But the early sides cut when the Byrds were both individually and collaboratively peaking contain a historic alchemy that would never be matched by any of the group’s original principals.